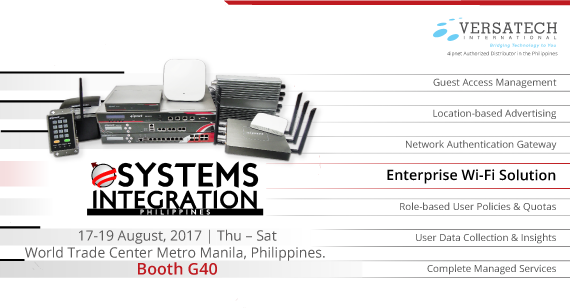 4ipnet, together with our authorized distributor – Versatech International, will be exhibiting its enterprise Wi-Fi connectivity, access control, and hotspot solution at Systems Integration Philippines 2017. It is our pleasure to invite you to visit our booth, Booth G40, between August 17-19. During the show, we will be showcasing our latest 11ac wave 2 Wi-Fi APs, and also introducing our partnership with Linkyfi, a value-added Wi-Fi marketing and location engine platform.